Shaeden Kadle (left) of Fortuna was hailed as the leader of his team as an offensive lineman and that team won CIF North Coast Section D4 title after winning CIF D5-A state crown last year. At right is Travion Brown of Temecula Linfield Christian. He is all-state small schools first team as linebacker with 122 tackles (including an amazing 37 for loss). The Washington State recruit also had 22 TD catches. Photos: Hudl.com & Spokesman.com. Two days after many of the state’s most deserving junior football players from the 2018 season were named to the all-state junior teams, we roll on with the 40th annual edition of the Cal-Hi Sports All-State Football Teams with those from small schools. It’s harder than ever with competitive equity playoff divisions to say which is a “small” school, but we’re not changing our format after all these years and we tend to know a small school when we see it. Schools landing multiple honorees for this year’s All-State Small Schools Football Teams include CIF state champions McClymonds of Oakland and Hilmar along with Colfax, Linfield Christian of Temecula and Kennedy of Delano. 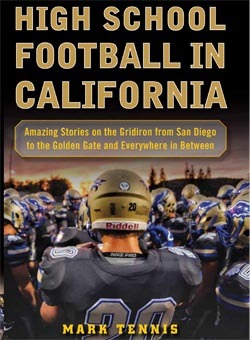 We hope you enjoy this free post on CalHiSports.com. The All-State Medium Schools Teams also will be free as will the All-State First Team Overall. If you want to see the already announced All-State Sophomore & Junior Teams and All-State Second & Third Team Overall plus many, new updated state record files and more exclusive content, please sign up today. You can now join for one-month rate of just $3.99. For subscription info, CLICK HERE. FOR ARCHIVE OF ALL-TIME ALL-STATE SMALL SCHOOL FOOTBALL TEAMS SINCE 1989, CLICK HERE. State Small Schools Player of the Year Alex Aguilar of Shafter is joined today by 59 others on the 2018 All-State Small Schools Football Teams as selected by Cal-Hi Sports. As as been the case over the years (this is the 40th year of Cal-Hi Sports all-state football teams), the small school squads were broken up into a 30-player first team and a 30-player second team. Order our book to celebrate all 40 years of the all-state football teams by CLICKING HERE. Aguilar and his team fell short of winning the CIF Central Section Division 5 title, but the 5-foot-11, 175-pound dual-threat quarterback overwhelmed other small school player of the year candidates by passing for 3,436 yards and 44 TDs and by rushing for 1,178 yards and 20 scores. He also ended his career with a section record 140 combined touchdowns plus 11,645 combined career yards. One of Shafter’s league rivals, Kennedy of Delano, did win the section title and is represented on the all-state teams with tackle Ivan Garza on first team offense and running back Tyreak Walker on second team offense. Walker rushed for 2,219 yards and 30 TDs and he caught 19 passes for 364 yards and a two additional scores. CIF Division 4-A state champion McClymonds of Oakland leads all schools with four all-state honorees. The Warriors, who have won CIF state titles in D5A and D4AA in the previous two seasons, already have celebrated head coach Michael Peters being the State Coach of the Year (regardless of classification) and Small Schools State Coach of the Year. They landed three-year standout and leading rusher Jarmar Julien on first team offense, University of Nevada-bound linebacker JaVanz Dornners on first team defense, senior tackle Mark Hoching on second team offense and San Jose State-bound running back Adi Anderson on second team multi-purpose. Anderson also played defensive back. CIF Division 6-AA state champion Hilmar has always been a powerhouse small school under head coach Frank Marques and the Yellowjackets have three players who are all-state. The list is led by first team linebacker Justin Rentfro, who piled up 131 tackles (including 18 in a section playoff win vs. Ripon Christian). Rentfro also rushed for 1,125 yards and 14 touchdowns on offense. The other two are second team multi-purpose Isaac Sharp (1,684 rushing yards and multiple kick return scores) and second team kicker Bryan Millan (72 PATs plus 4 of 6 on field goals with long of 44 yards). Note: Schools broken down into large, medium and small based on section playoff divisions but also on where they’ve been traditionally. We also will not generally consider a school close to or above 1,500 enrollment small school at all no matter what section or state playoff division that school is placed. This means schools like Rio Linda, San Diego High and Lincoln of San Francisco, which won CIF state titles, can’t ever be a “small” school. Medium, yes. Small, no. Many of the CIF L.A. City Section playoff teams, including D2 and D3, can’t be small schools, either, for same reason. This year, we also have had to move up several private schools that previously were “small” but played in much higher section or state playoff divisions. Capital Christian of Sacramento, for example, is now no longer a “small” school. For the same reasons, this also may be the last year that McClymonds of Oakland can be considered for the small schools all-state teams. Blake Kirshner averaged nearly 300 yards passing per game for Santa Clarita Christian and finished his career with 6,894 yards and 90 TDs. Photo: Dan Watson / signalscv.com. WR Preston Conti (Minarets, O’Neals) 6-2, 175, Sr.
WR Jake Green (Colfax) 6-2, 190, Sr.
OL George Becker (Gridley) 6-5, 250, Sr.
OL Ivan Garza (Kennedy, Delano) 6-5, 275, Sr.
OL Shaeden Kadle (Fortuna) 6-0, 260, Sr.
OL Nathan Peterson (Dixon) 6-5, 290, Sr.
OL Brad Whitworth (Linfield Christian, Temecula) 6-5, 285, Sr.
QB Blake Kirshner (Santa Clarita Christian, Canyon Country) 6-5, 200, Sr.
RB Marshawn Buchanan (Adelanto) 5-11, 190, Jr.
RB Jarmar Julien (McClymonds, Oakland) 5-11, 225, Sr.
RB Taron Madison (Banning) 6-1, 190, Sr.
PK Ronan Donnelly (Sacred Heart Prep, Atherton) 6-1, 175, Jr.
DL Robert Brown (Carmel) 6-2, 285, Sr.
DL Jonny Garnett (Campbell Hall, N. Hollywood) 6-4, 200, Sr.
DL Xavier Carlton (Modesto Christian) 6-7, 250, Jr.
DL William Vehikite (Stellar Prep, Oakland) 6-4, 295, Sr.
LB Travion Brown (Linfield Christian, Temecula) 6-3, 200, Sr.
LB JaVanz Dornners (McClymonds, Oakland) 6-2, 220, Sr.
LB Justin Rentfro (Hilmar) 6-1, 210, Sr.
LB Bailey Sulzer (West Valley, Cottonwood) 5-11, 200, Sr.
DB Michael Linguadoca (Santa Fe Christian, Solana Beach) 6-0, 175, Sr.
DB Andrew Seymour (St. Francis, Watsonville) 5-9, 165, Sr.
DB Michael Vivo (Waterford) 6-1, 185, Sr.
P Ryan Sanborn (Parker, San Diego) 6-3, 180, Sr.
QB/RB Alex Aguilar (Shafter) 5-11, 175, Sr.
QB/ATH Akil Edwards (St. Patrick-St. Vincent, Vallejo) 5-10, 165, Sr.
RB/KR Fresh Ison (Moreau Catholic, Hayward) 6-0, 205, Jr.
RB/DB Michael Kamps (Ripon Christian) 5-11, 185, Sr.
RB/DB/KR Tre Moronic (Bear River, Lake of the Pines) 6-4, 185, Jr.
RB/LB Wyatt Roth (Liberty, Madera Ranchos) 6-1, 220, Sr.
It’s hard to find candidates from small schools in the CIF L.A. City Section, but found one this year. Travon Young was All-City and had 10 tackles in one game vs. large school Crenshaw and had 18 vs. large school Westchester. Young also has a 3.86 GPA. Photo: Amanda Scurlock / L.A. Sentinel. WR Tyler Vargas (Orestimba, Newman) 5-8, 160, Sr.
OL Giovanni Antonini (St. Vincent de Paul, Petaluma) 6-3, 245, Jr.
OL Connor Chase (St. Bernard’s, Eureka) 6-1, 300, Sr.
OL Wiley Drummond (Colfax) 6-5, 270, Jr.
OL Mark Hoching (McClymonds, Oakland) 6-2, 290, Sr.
OL Dovid Rabinowitz (Malibu) 6-5, 265, Sr.
QB Alex Weir (Colfax) 6-0, 185, Sr.
RB Tyler Boston (Dixon) 6-0, 190, Sr.
RB Payton Flores (Gonzales) 5-10, 165, Sr.
RB Drake Harbison (Middletown) 5-11, 190, Sr.
RB Tyreak Walker (Kennedy, Delano) 5-10, 170, Sr.
PK Bryan Millan (Hilmar) 5-7, 150, Sr.
DL Carson Drake (Santa Fe Christian, Solana Beach) 6-4, 250, Sr.
DL Drew Van Vliet (Ripon Christian) 6-4, 260, Sr.
DL Jacob Walden (Escalon) 6-2, 200, Jr.
LB Thomas Braconier (Xavier Prep, Palm Desert) 6-1, 190, Sr.
LB Dyllan Hyde (East Nicolaus, Nicolaus) 6-1, 230, Sr.
LB Koa Todd (St. Margaret’s, SJ Capistrano) 6-1, 210, Sr.
LB George Udo (Berean Christian, Walnut Creek) 6-1, 205, Sr.
LB Cameron Will (Mountain Empire, Pine Valley) 6-4, 220, Sr.
DB Chase Jones (Mission Prep, San Luis Obispo) 5-9, 165, Sr.
DB Lovelace Rufus (Moreau Catholic, Hayward) 6-3, 180, Sr.
DB Travon Young (View Park, Los Angeles) 5-9, 165, Sr.
P Cody McIntyre (Sutter) 5-9, 165, Jr.
RB/DB Adi Anderson (McClymonds, Oakland) 5-11, 200, Sr.
QB/RB/DB Daniel Carrion (Winters) 6-3, 190, Sr.
RB/LB Ryan Hurley (Rio Vista) 5-8, 200, Sr.
RB/WR/KR Bralyn Lux (King’s Academy, Sunnyvale) 5-9, 170, Sr.
QB/RB Kaleb Maresh (Linfield Christian, Temecula) 6-1, 190, Sr.
RB/KR Isaac Sharp (Hilmar) 5-11, 175, Sr.